Afternoon trips to the beach aren’t just for sandcastles and sunbathing. Research has proven that in addition to beautiful views, walking on the beach has several health benefits. Walking on sand requires 1.6 to 2.5 times more mechanical work according to the Journal of Experimental Biology. This means your muscles and tendons work harder. It takes 2.1 to 2.7 times more energy to walk on sand than it takes to walk on a hard surface at the same pace (Journal of Experimental Biology). More energy means more calories burned. In fact, Berkeley Wellness states walking on soft sand increases caloric expenditure by almost 50 percent. Unlike a sidewalk, sand is an uneven surface. Walking on it challenges your ability to know where your feet are without looking at them. This sense of body is called proprioception. Proprioceptive exercises help to develop balance, coordination and agility. The local public beach is bordered by private property. 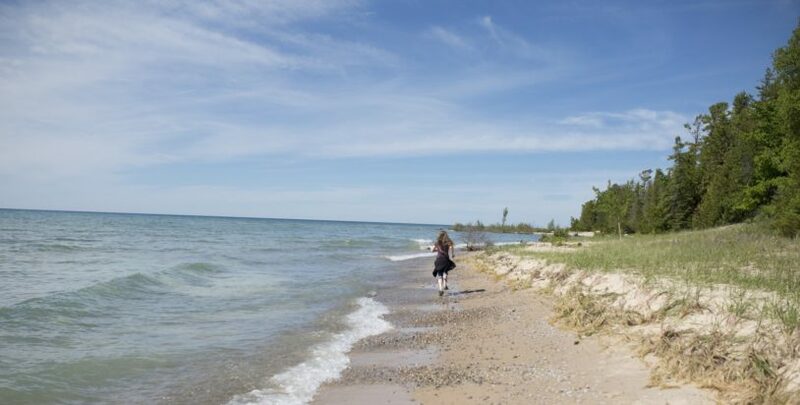 Can you walk along the shoreline of private property? The mark is defined as the point on the bank or shore up to which the presence and action of the water is so continuous as to leave a distinct mark either by erosion, destruction of terrestrial vegetation (plants that grow on or in the land rather than living in water or on rocks or trees) or other easily recognized characteristics. The court didn’t address activities other than walking or running such as campfires, picnics, playing volleyball, etc. While it is implicit that the public cannot do these things on private property, the court didn’t specifically address them. You can play it safe by keeping your feet in the water.